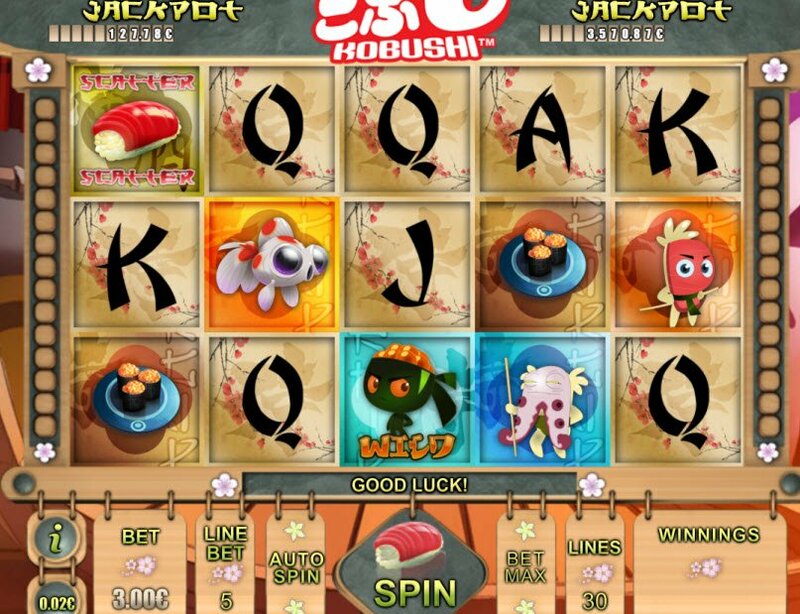 The Kobushi slot machine will transport you to a Japanese sushi house. The 5-reel, 30-payline video slot features cute little anime sushi ninjas. Reel images take inspiration from Japanese cultural icons including cherry blossoms, Koi fish, sashimi, and sushi rolls. The graphics look great, and you’ll love the Asian-inspired soundtrack. It’s sushi time with the Kobushi slot game. With this online casino game, you’ll visit the Land of the Rising Sun right from your computer. Powered by iSoftBet, the slot machine features clever characters that appear to be little sushi people. The game really captures the Japanese anime fantasy. Winning money online just got even better! In terms of quality and originality, this one gets an A+ for gaming graphics. 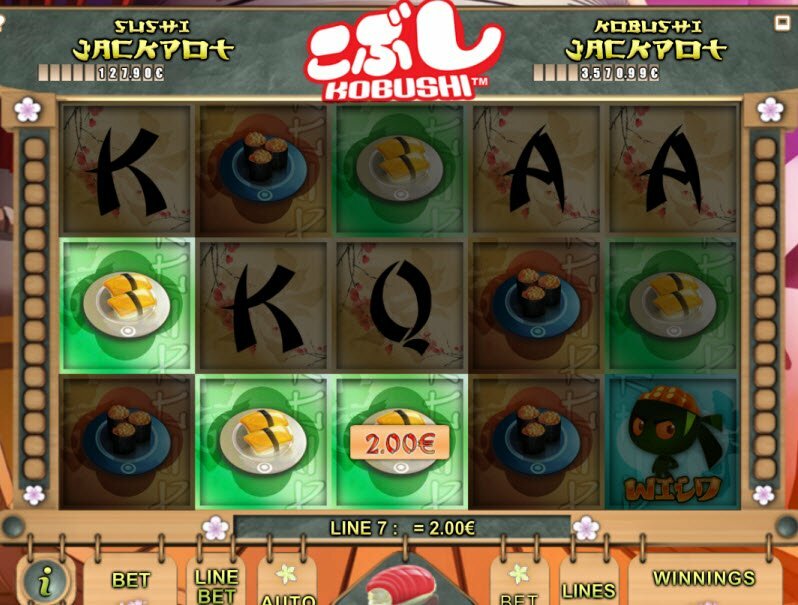 The Kobushi slot machine takes online casino gaming to a whole new level with its cleverly designed 3D sushi characters that channel the Japanese anime and fantasy genre. I love the bonus symbol of a sushi ninja that shows off karate moves during a winning combination. Spin the reels and enjoy images of cherry blossoms, Koi fish, sashimi, and sushi rolls. Meanwhile, traditional Japanese music plays in the background making you feel as though you were sitting in a teahouse. Kobushi takes online casino gaming to a whole new level with its cleverly designed 3D sushi characters that channel the Japanese anime and fantasy genre. 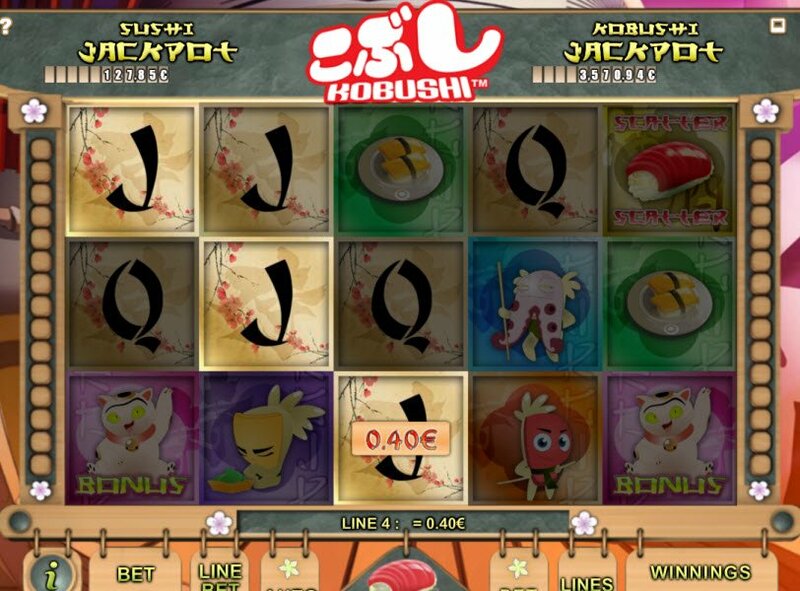 The Kobushi slot jackpots include both the Sushi and Kobushi progressive Jackpots that keep growing each day. With two Jackpots, you have even more chances to strike gold. The Kobushi slot game also includes various Bonus symbols as well as Wild and Scatter symbols. Unfortunately, the game doesn’t have a paytable to outline paylines and game rules (or at least I couldn’t find one). In addition, you won’t find any bonus games or gamble rounds. All the same, the Kobushi slot machine really packs a punch.